Slam Dunk may have been the series that put Takehiko Inoue on the map and introduced legions of Japanese kids to basketball, but for me, a long-time hoops fan who grew up watching Larry Bird lead the Celtics to numerous NBA champtionships, Slam Dunk was a disappointment, a shonen sports comedy whose goofy hero desperately needed a summer at Robert Parrish Basketball Camp for schooling in the basics. Real, on the other hand, offered this armchair point guard something new: a window into the fiercely competitive world of wheelchair basketball. Watching Inoue’s characters run a man-to-man defense and shoot three-pointers from their chairs gave me a fresh appreciation for just how much strength, stamina, and smarts it takes to play the game, with or without the use of ones’ legs. Much of the series’ appeal lies with Inoue’s superb draftsmanship. As he does in both Slam Dunk and Vagabond, he immerses us in the action, making us feel as if we’re on the court with his characters, bumping rims and talking trash. No detail is squandered; even a close-up of a character’s eyes or hands helps us picture where his teammates are on the court, and imagine how the play might unfold. Remake or retread? That’s the question facing critics whenever someone updates a classic novel or favorite film, be it Pride and Prejudice or The Taking of Pelham One Two Three. A remake brings new urgency or wit to the original story, new clarity to its structure, or new life to a premise that, by virtue of social or technological change, seems dated—think of Philip Kaufman’s The Invasion of the Body Snatchers, which infused a 1950s it-came-from-outer-space story with a healthy dose of seventies paranoia, or Alfred Hitchcock’s 1955 version of The Man Who Knew Too Much, which featured a leaner, meaner script than his 1934 original. Retreads, on the other hand, evoke the letter but not the spirit of the originals, embellishing their plots with fussy details, slangy dialogue, or new characters without adding anything of value—think of Ethan and Joel Coens’ deep-fried version of The Ladykillers, which was louder, cruder, and longer than the 1955 film, yet decidedly less funny. 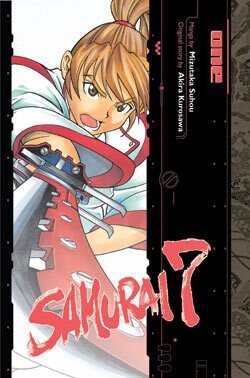 Samurai 7, a mangafication of Akira Kurosawa’s The Seven Samurai, falls somewhere between these poles, treating the source material respectfully without adding anything particularly new or interesting to the mix. The basic plot remains the same: a poor rural village hires seven samurai to protect them from a band of thugs who steal their rice and enslave their womenfolk. Though the manga takes minor liberties with the main characters—one is a headless cyborg, one is a bishonen who always seems to be falling out of his yukata—the samurai bear a strong resemblance to Kurosawa’s original crew, both in terms of their personalities and functions within the group. The manga also preserves the war-ravaged atmosphere of the original, substituting a robot-fueled world war for the carnage caused by sixteenth-century daimyo. Mourning the cancellation of Suppli? Still in Tramps Like Us withdrawal? 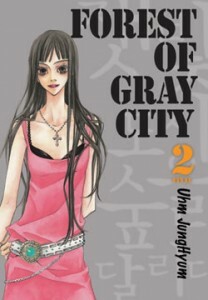 Then I have something to help you heal that josei jones: Forest of Gray City, a two-volume soap opera about a twenty-something woman and her nineteen-year-old roommate—a May-July romance, if you will. Forest of Gray City begins with a meet-cute scene as precious as anything in a Nora Ephron movie. Single and cash-strapped, illustrator Yun-Ook Jang posts an ad for a roommate. No one seems interested until Bum-Moo Lee, an aloof, impeccably dressed young man shows up at her door. She pleads with him to take the room. He accepts. There’s just one problem: Yun-Ook is tipsy and tearful when Bum-Moo arrives, and fails to recognize him as the barkeep she rudely dressed down just a few days prior to posting her ad. When she sobers up, Yun-Ook discovers that Bum-Moo makes a surprisingly good housemate. But would he make a good life mate? That’s the question at the heart of Forest of Gray City, as Yun-Ook wrestles with her attraction to Bum-Moo, an attraction complicated by romantic rivals, family entanglements, ambitious career goals, and that pesky age gap. Though we learn a lot about Yun-Ook in these opening chapters, Bum-Moo remains a cipher for much of volume one. 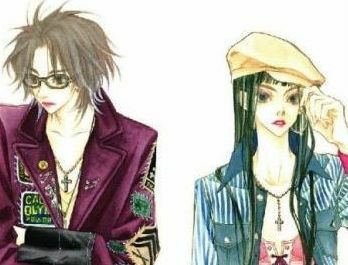 Given his age and his lack of direction—he’s a high school drop out—that seems appropriate, and helps explain why Yun-Ook initially rebuffs him when he asks, “Is it OK to have a crush on you?” Volume two provides the missing pieces in Bum-Moo’s history, beginning with an extended flashback to Bum-Moo’s relationship with his stepsister, an unhappily married college graduate who harbors an unhealthy attachment to her younger brother. Volume two packs enough sudsy twists for a sweeps’ week worth of General Hospital episodes, from second-chance weddings and fatal car crashes to law suits, abusive husbands, and romantic rivals. Yet Forest of Gray City never devolves into melodrama, thanks to the quiet, relaxed presentation of the story. 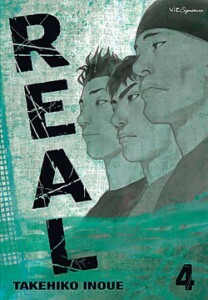 Artist Jung-Hyun Uhm relies on close-ups and body language instead of idle chatter to suggest her characters’ feelings. Midway through volume one, for example, there’s a lovely sequence in which Bum-Moo consoles his drunken, agitated roommate. Yun-Ook—who has just returned from a close friend’s wedding—is feeling unsettled and lonely, masking her anxiety with the defensive assertion that “Marriage isn’t the goal in life!” Bum-Moo offers no words of wisdom or soothing comments, just a glass of water and an arm to lean on. He sits with Yun-Ook until she falls asleep, then retreats to his own room looking dazed and wounded. It isn’t a profound moment, but it’s an honest one, and the kind of scene I wish I found in more manga. Speaking of Uhm’s artwork, I think it’s both a strength and a weakness of this series. Her character designs are elegant if typical for sunjeong manhwa: both Bum-Moo and Yun-Ook are unnaturally long and slender with pretty faces, giraffe-like necks, and sparkling eyes, making them ideal mannequins for an assortment of elaborate, stylish outfits. The backgrounds, on the other hand, are very minimal. In some scenes, the lack of detail is effective; Yun-Ook’s apartment, for example, looks like my very first studio, complete with rickety, self-assembled furniture and improvised bookshelves. In others scenes, the backdrops look unfinished or hastily drawn, especially when contrasted with the characters’ costumes. On the whole, however, I found the artist’s preference for white spaces and spare interiors an effective metaphor for her characters’ sense of isolation. Much as I like the artwork and the pacing, the real selling point of Forest of Gray City is its strong, plausible heroine. Yun-Ook isn’t just a collection of quirks and mannerisms, but a young woman with real problems and real aspirations. She’s impetuous, insecure, and quick to take offense, but she’s also focused on her career, protective of Bum-Moo, and determined not to sacrifice her sense of self just to land a husband. There’s a level of emotional authenticity about her character that will resonate with female readers in their twenties and thirties, even if her story seems more firmly rooted in romance novel convention than reality. Highly recommended. This review is a synthesis of two earlier reviews posted at PopCultureShock. My original review of volume one can be found here; my original review of volume two can be found here.